QCA9880 WLE900VX - 7A 802.11ac miniPCIe WiFi module, Dual Band - CE, FCC and Japan certified !! 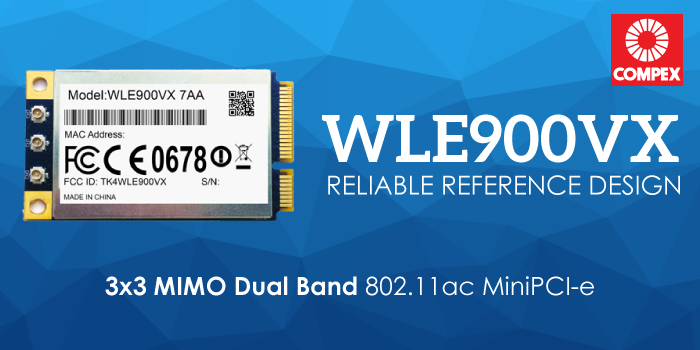 The WLE900VX is an IEEE 802.11ac wireless adapter that operates in 2.4GHz and 5.0 GHz bands, available in PCIe mini card form factor. Featuring QCA9880 chipset, the WLE900VX dramatically increases the overall throughput up to 1.3Gbps with 3 x 3 MIMO technique. Leveraging the revolutionary 11ac technology, WLE900VX sets a new benchmark in throughput and range, making it ideal for consumer and enterprise applications, such as video, voice and data transmission. The WLE900VX is backward compatible with 802.11a/b/g/n and fully supports industry standards compliant security. - FCC and CE Certified! customer was required to update their kernel by edited /drivers/net/wireless/ath/regd.c with change the following "reg->country_code = CTRY_UNITED_STATES;" to their country accordingly since this is an initial limitations of the card from Linux operating system itself. They have been installed in our test-bed, more info can be f ..